A 3-member PEJ delegates headed by PEJ President Soko Aoki along with Athlete Society Chairman Dai Tamesue and well-wisher Issei Murakami traveled to Nepal during September 19, 2015 and September 24, 2015. Here is a brief summary of the visit. 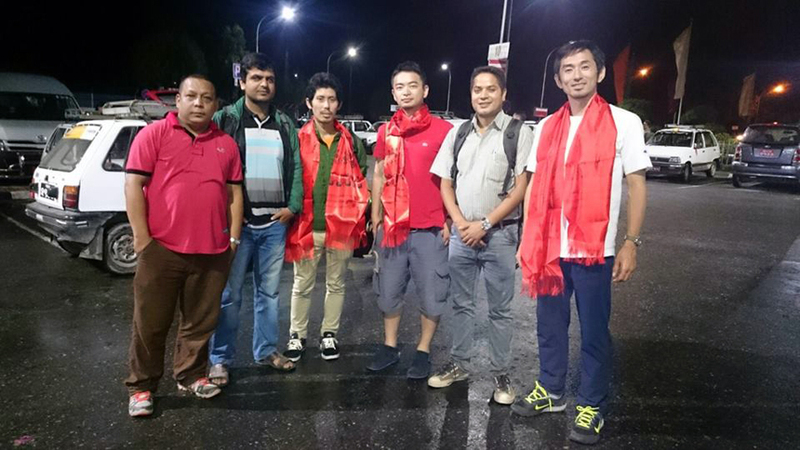 PEN President Sujan Koirala, Secretary Binod P. Mainali and Treasurer Bal Gopal Shrestha warmly welcomed PEJ President Soko Aoki, Athlete Society Chairman Dai Tamesue and well wisher Issei Murakami at Tribhuvan International Airport, Kathmandu at 10:00pm on September 19, 2015. They could have a brief discussion on next day’s sprint training at the Fuji Hotel. On September 20, Athlete Society (AS) in association with Nepal Athletics Association (NAA) conducted one day sprint training for Nepali short distance runner at Dasharath Stadium, Kathmandu. NAA Secretary General Sunil Rajbanshi coordinated the opening session. He gave a brief introduction of the programme. One by one, athletes and coaches gave a brief self-introduction. Altogether 20 national level athletes were present to take part in the training. He felt an immense pride in introducing coordinator of the training Dai Tamesue, a very high profile athlete from Japan: the 2 times bronze medalists of 400m hurdles in World Athletics and 3 times participants of Olympic Games, now the Chairman of AS coming all the way from Japan to train the Nepali athletes. NAA President and Hon. CA Member Rajeev Bikram Shah expressed happiness that a high profile athlete Dai Tamesue has been coordinating the training for the Nepali athletes and extended best wishes for the success. Training session began with a warming up by the athletes. After warm up, Dai Tamesue coached athletes on sprint and running forms followed by start using starting blocks. In the last session, he introduced sprint drill and explained many ways of running practice. He was facilitated by NAA Chief Coach Sushil Narsingh Rana and other national coaches. 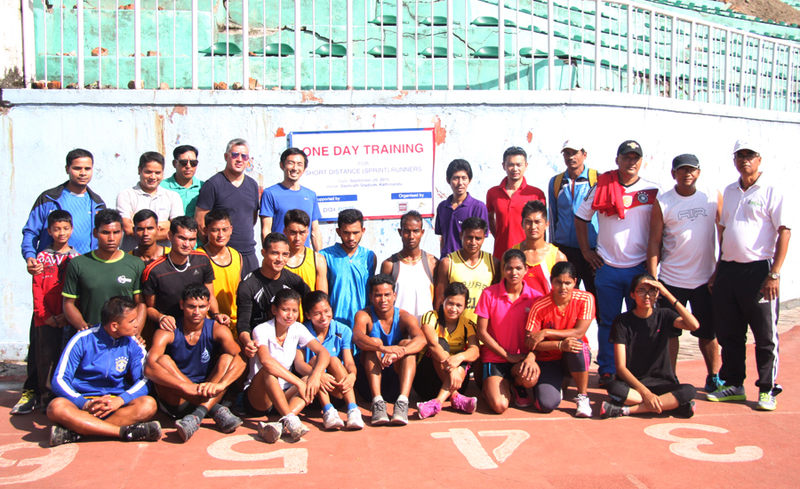 The training was recognised by Nepal Olympic Committee (NOC) and supported by Pax Earth. In the closing session, on behalf of NAA, President Rajeev Bikram Shah extended vote of thanks to Dai Tamesue for coming a long way to train the Nepali athletes. He appreciated role of Pax Earth in inviting such a high profile athlete to train Nepali athletes. He was confident that the athletes could enhance their technical skill to some extent from the training and key tips of Dai Tamesue. He hoped the collaboration between NAA, AS, NOC and Pax Earth to continue in the days to come. He wished that the Nepali athletes to get more training opportunities under him and world class coaches with his cooperation. He thanked all the athletes for their active participation and showing high spirit during the training. He imparted some useful motivational tips to excel ahead in their endeavours. He suggested them to set goals and work hard to achieve them. He has assured that NAA will continue to provide more training opportunities in national and international level in future. Dai Tamesue, in his special address, thanked all the athletes for the active participation and Nepali coaches for their cooperation to conduct the training successfully despite the risk and challenge of general strike. He told that the Nepali athletes have potentials and these potentials can be converted into performance by giving them proper training opportunities and exposures. He highly praised NAA team for all the arrangement and cooperation in organising the training. He was thankful to NOC and Pax Earth for their support for the training. He has assured to extend all possible support in strengthening Nepali athletes towards Tokyo Olympics 2020. For this, he will continue such training in Nepal and also explore the opportunity to train these athletes in Japan. He wished to see some of these athletes in Tokyo Olympics 2020. On behalf of athletes, an athlete heartily thanked Dai Tamesue for providing a great training opportunity and expected to get more training opportunities in Nepal and Japan in future. He admitted if they could get more relevant training and exposure opportunities, they may succeed in qualifying for Tokyo Olympics 2020. He admired the role of NAA in strengthening Nepali athletes by sending in training in international front. He is thankful to Pax Earth for inviting a high profile athlete to train them. NAA Vice President Sanjib Tuladhar, PEN President Sujan Koirala, PEJ President Soko Aoki, Secretary Binod P. Mainali, Member Debraj Ghimire and well-wisher Issei Murakami were also present to facilitate the training. In the afternoon, NAA Vice President Sanjib Tuladhar hosted a lunch in an honour of Dai Tamesue and his team at MEZZE by Roadhouse located at Durbar Marg, Kathmandu. A few key executives from NAA and Pax Earth attended the lunch. In the evening, President Sujan Koirala took President Soko Aoki and Issei Murakami to Boudhanath. As it was the first visit of Issei Murakami to Nepal, he was not fortunate to see the original stupa as the top section was destroyed by the earthquake on April 25, 2015. The stupa is under renovation. On September 21, a 12-member Pax Earth team led by PEN President Sujan Koirala along with PEJ President Soko Aoki, Secretary Binod P. Mainali, Members: Dai Tamesue, Manohar Sapkota, Peter Badal, Kapil Deuja, Prabin Giri, Issei Murakami, Dipesh Deuja, Harindra Lal Shrestha and Shyam Magar travelled to Kanpur VDC, Kavre and observed the post earthquake rehabilitation work. They visited Shree Raktakali Primary School to observe ongoing construction of temporary rooms. 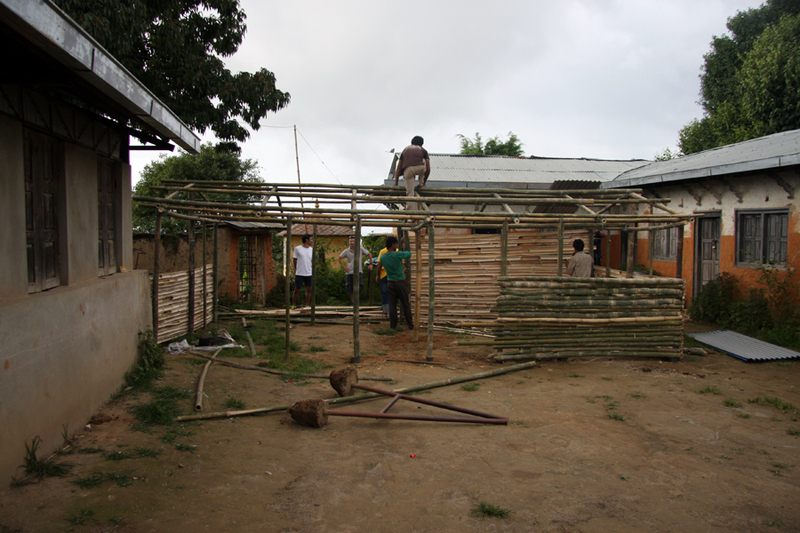 The two temporary rooms are being constructed using bamboos and corrugated steel sheets in the school premises. 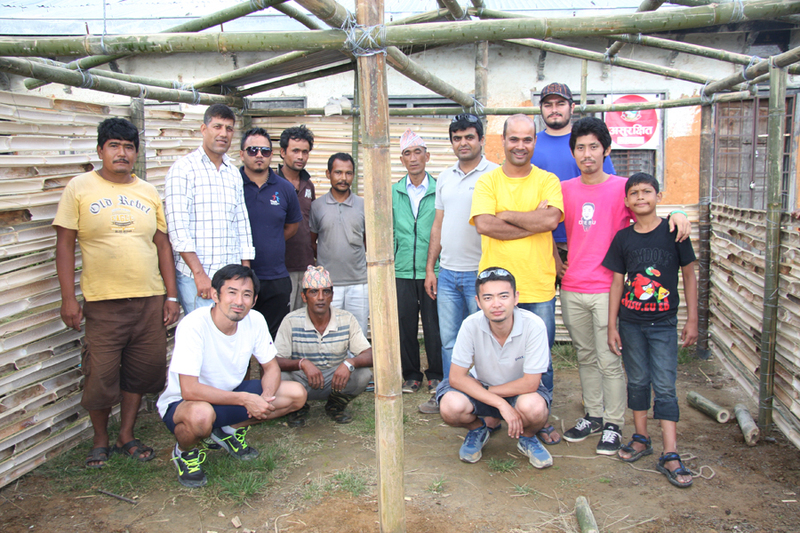 The pax team handed corrugated steel sheets and fixing materials to Principal Hira Kaji Tamang to complete the temporary rooms. 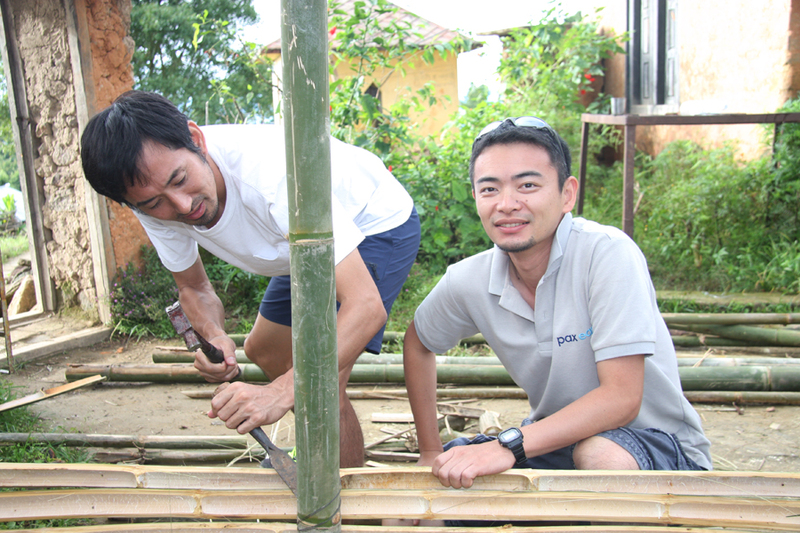 Thanks to the genuine effort of community people, the (bamboo) structure was already made according to a guidance provided by Pax Earth. 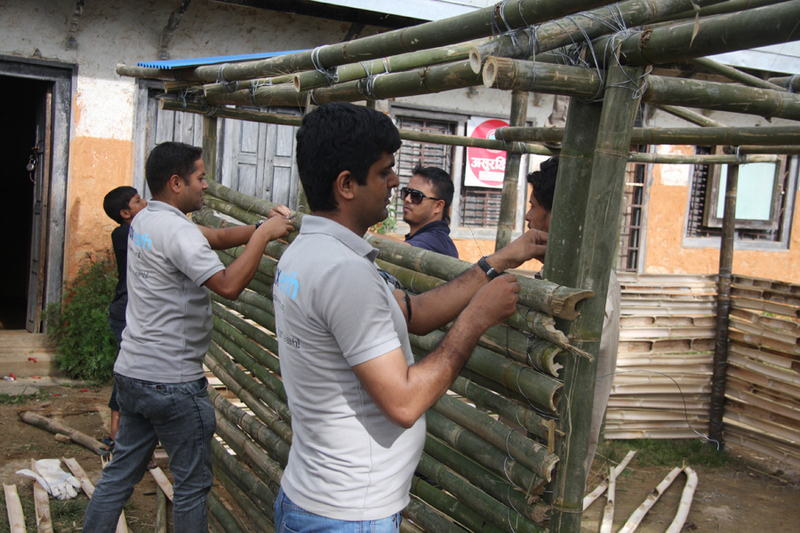 The pax team could only involve in making the bamboo wall for a while as the weather and road condition did not allow them to spend enough time to complete the construction. The pax team also observed a prototype rain water supported drip irrigation model being tested at a farmland of Secretary Binod P. Mainali in Kanpur. 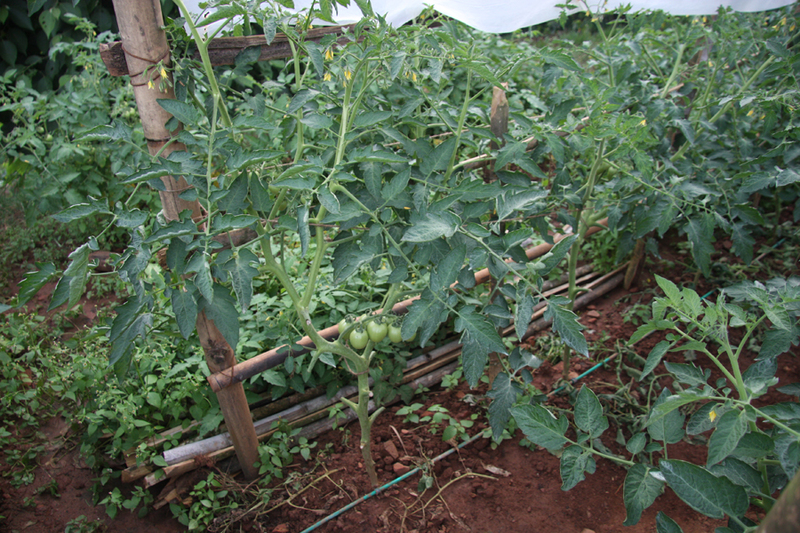 The model is a perfect combo of a plastic pond, rain water harvesting, a simple drip irrigation system, a tunnel and (tomato) farming. The model which was installed in the last week of July 2015 has started to show a good progress. 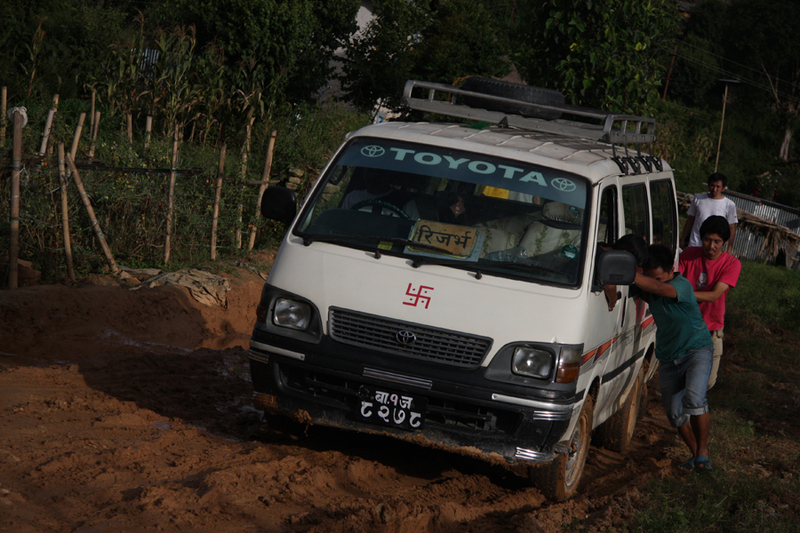 During the traveling, the treacherous road offered some great adventure and a tough problem too – the pax team’s micro-van trapped at a road while returning to main road after observing the irrigation model in Kanpur. The Pax team managed to resolve it with a great deal of patience and collective undying effort. The two and half hours relentless effort, pulling and pushing the micro without caring any muscle pain, did not produce any indication of reaching to a solution. Thanks to a courtesy of a few local people, the pax team could persuade a driver to pull the micro-van through his jeep. Each member deserved a special thank for pouring hardest effort and showing a great character and team spirit in solving the problem. PEJ delegates traveled to India during September 22 and September 24. They could visit Sony India, Indian Olympic Association and Taaj Mahal during their India tour. PEJ delegates arrived from India in the morning of September 24. 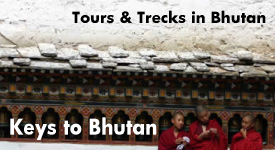 They could manage to visit Pashupatinath temple right after their arrival. President Sujan Koirala and Member Prabin Giri guided them through the Pashupatinath. They could enjoy tea at Akira Cafe too. AS Chairman Dai Tamesue along with PEJ President Soko Aoki, PEN President Sujan Koirala and Issei Murakami had a courtesy visit to NOC President elect Jeevan Ram Shrestha at Nepal Olympic building, Satdobato, Lalitpur. The meeting was coordinated by NAA Secretary General Sunil Rajbanshi. Nepal Boxing Association President Rajiv Shrestha also joined the meeting. Chairman Dai Tamesue shared the purpose of the visit and the training organised for athletes on September 20. He is interested to work with NOC in strengthening Nepali athletes towards Tokyo Olympics 2020. President elect Jeevan Ram Shrestha was very positive with his proposal and assured to put forward the proposal at the NOC board meeting. He will also consult with National Sports Council, comply with NOC rules and regulations, and accordingly make decision to award Chairman Dai Tamesue a suitable title. Pax Earth delegates could have a very important meeting with H.E. Ambassador of Japan to Nepal, First Secretary (Information & Culture), Second Secretary (Economic Cooperation Section and Programme Manager (Grant Assistance for Grassroots Human Security Projects – GGP) at Embassy of Japan in Nepal, Panipokhari, Kathmandu. PEJ President Soko Aoki presented Pax Earth’s activities particularly in Kavre. He also shared about prototype rain water harvesting supported irrigation project being tested in Kavre and inquired the grant support available from the Embassy of Japan in Nepal. Pax Earth can turn in an application for GGP scheme. Though there is a tough competition for the grant, Pax Earth is willing to turn in an application for this irrigation project in Kot Timal. The joint meeting of PEN and PEJ was held at the PEN Secretariat, Pashupati in the evening. In addition to President duo, Vice President Guna Raj Pyakurel, Secretary Binod P. Mainali, Treasurer Bal Gopal Shrestha, Joint Treasurer Jamuna Siwakoti, Executive Member Laxman B. Pahari, Members: Debraj Ghimire, Sachin Koirala, Peter Badal, Kapil Deuja, Ram Sharan Paudel, Akira Sahukhal, Prabin Giri and Issei Murakami were present at the meeting. President Soko Aoki shared two main purposes of this visit: one is to conduct one day sprint training for national level athletes and to observe the prototype rain water supported drip irrigation model being tested at the farmland of Secretary Binod P. Mainali in Kavre. He was glad that the sprint training was very successful. 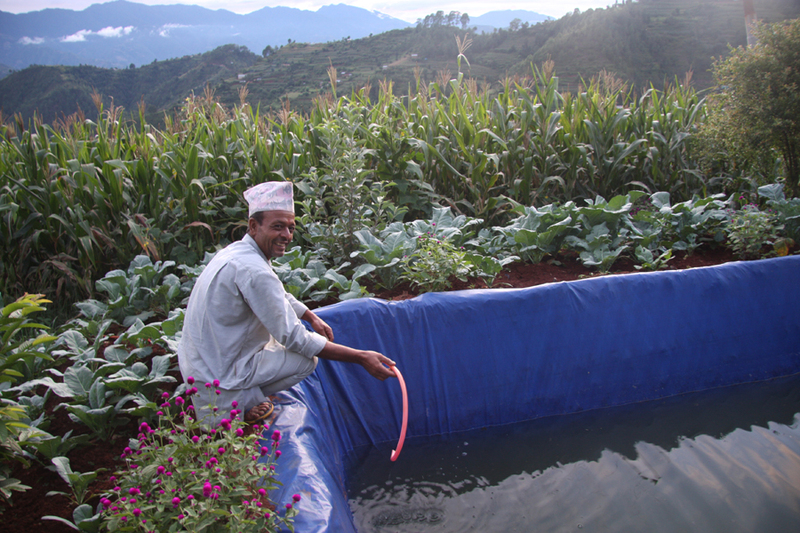 Similarly, he is quite happy with the result of prototype irrigation model. He is equally satisfied with the relief and rehabilitation activities of Pax Earth. He expressed happiness that all Pax Earth members, well-wishers and families could survive the devastating earthquake in Nepal. After the earthquake, the priority of the Pax Earth has shifted to relief and rehabilitation effort. He is very happy with the way Pax Earth has carried out its relief and rehabilitation activities in Kavre. He hoped that the rehabilitation effort will finish after constructing temporary school in Kot Timal. He wished to know the course of action of Pax Earth in second half of FY 2015/16. In reply to his query, President Sujan Koirala told that PEN will continue to preserve tree plants, observe the results of prototype drip irrigation model, conduct a youth leadership programme, carryout an educational materials distribution, organise a tree plantation in the second half of FY 2015/16. PEN members could enjoy some chocolates and ball point pens presented as souvenirs by President Soko Aoki. President Sujan Koirala, Members: Debraj Ghimire and Sachin Koirala bid farewell to PEJ President Soko Aoki, Member Dai Tamesue and Issei Murakami at the Tribhuvan International Airport, Kathmandu at 9.00pm. The PEJ delegates’ entire visit was coordinated by President Sujan Koirala. PEN believes that the purpose of PEJ delegates’ Nepal visit has been fulfilled and their stay in Nepal was memorable.